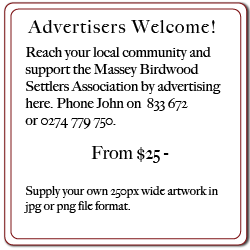 For over fifty years Massey Birdwood Settlers Association has operated its own hall at the top of the hill, on the corner of Don Buck and Red Hills roads. The association is currently undertaking a ‘freshening’; repainting the insides and refurbishing and recovering furniture and fittings, thanks to a grant from the Henderson Massey Local Board. Recently the association installed heat pumps for both the main hall and the smaller Lions Den, an area constantly in demand by the community for smaller group meetings. 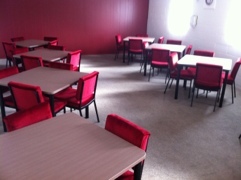 A number of Local Massey tradespeople have been used to undertake the refit of the hall, including T&K Upholstery on Royal Road, Massey Maintenance, Lewins Electrical, Jefferies Plumbing and Western Lock Services. The heat pumps were installed by Air Conditioning Services ( one of the Directors is a local). The carpet is from Carpet and Matland in Henderson. The Massey Birdwood Settlers Hall is home to the Waitakere City Cake Decorating Club on Saturday mornings, Massey Primary School Housie, Red Hills Kindy, the Fitness League (Friday mornings), Creative Memories (Saturdays once a month), Auckland 7th Day Adventist Church Chinese , Kung Fu (Thursdays), Massey Indoor Bowls (Wednesdays), Line Dancing Tuesdays). Shalom Celebration Church (Sunday), a Wine Club and Westside Fellowship Church (Sunday afternoons) as well as the Association itself on the last Thursday of every month. Association Secretary John Riddell, is looking forward to increased patronage of the Hall, as a result of the freshening. The hall used to be the home of the Massey Library, the CAB and Barnardos as well the Massey Community Board meetings. These were some of the many of the activities that were held in the facility in past years. Profits from rents along with grant money is poured back into the up keep and improvement of the Hall as well as providing information for the community and assets such as a defibrillator which is available for use by the local doctor in case of an emergency. The hall is also used by Lincoln Primary School if ever needed should a Civil emergency mean the school can not be used.